Now that the new 2017 American College of Cardiology/American Heart Association guideline for the detection, prevention, management, and treatment of high blood pressure was unveiled to the medical community in November 2017, this month, designated American Heart Month, is the perfect time for nutrition professionals to address this with clients and patients. No longer is the blood pressure reading 140/90 mm Hg the benchmark for a hypertension diagnosis. It's now 130/80 mm Hg to allow for earlier lifestyle and pharmacologic interventions, if needed, and help prevent development of cardiovascular complications. As a result of the new guideline, more than 100 million people now have hypertension, rates could triple in men and double in women aged 20–44, about three-fourths of men aged 55–74 could be diagnosed, and black and Hispanic men will experience a 17% increase in rates, while Asian men will see a 16% increase. These stats are alarming, so there will be many opportunities to discuss the new guideline and lifestyle and dietary interventions that will help lower blood pressure in these populations. Dietitians who can take blood pressure readings should make it a habit to do so at every counseling session with patients. That way, if readings are above normal you can begin discussing the new guideline as well as prevention and management strategies. The new guideline eliminates the prehypertension category; normal blood pressure is now <120/80 mm Hg; elevated is 120 to 129 (systolic), less than 80 (diastolic); stage 1 hypertension is between 130 and 139 (systolic), between 80 and 89 (diastolic); stage 2 hypertension is 140 or higher (systolic), 90 or higher (diastolic); and hypertensive crisis is >180 (systolic), >120 (diastolic). These criteria are so important to remember when counseling patients about heart health. The more knowledge you have as dietitians, the better the patient care you can provide. 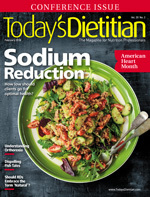 In honor of American Heart Month, Today's Dietitian is featuring the article "Sodium Reduction" on page 18. Also in this issue are articles on orthorexia, "natural" product trends, and dispelling fish tales. Please enjoy the issue!